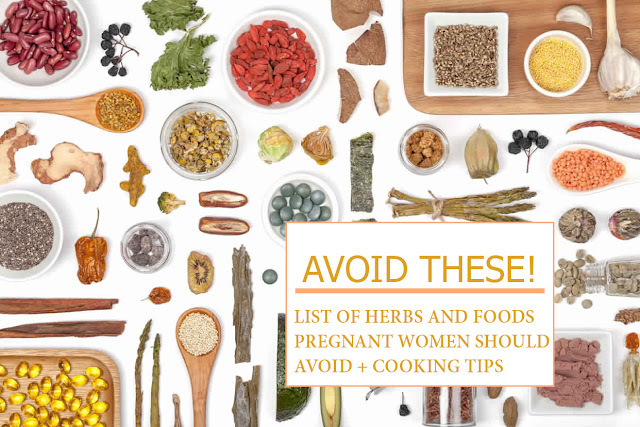 The questions have abounded about foods and herbs that can harm pregnancy and possibly cause early miscarriage and trauma to both the mother and her fetus. In this article, I'll explain briefly the major herbs and foods that you must avoid during pregnancy and the harms they can cause. As well as some tips on how to prepare food properly in order to avoid harmful bacteria. A pregnant woman must not use Angelica because this genus works to stimulate the uterus and thus causing early abortion. It also causes contractions in the uterus, causing miscarriage. Caffeine has a serious impact on fetus's health if consumed highly through coffee and soft drinks or energy drinks or chocolate, cocoa or all tea that contains caffeine, but If you take a simple proportions and reasonable amounts then it will have no effect on the fetus, yet high amounts of caffeine can cause the fall of the embryo, as well as a lack of weight at birth. The caffeine stimulant substance can cause chemical changes in the fetus's growth, so you must stop consuming all kinds of caffeine or at least reduce as much of it as possible during pregnancy. A pregnant woman should not consume Ginseng, because it works to stimulate the uterus and thus the occurrence of early abortion. A pregnant woman should not use licorice because this herb works to stimulate the uterus and thus causing a miscarriage. On top of that, it also detained fluids in the body and raises the pressure that would cause the death of the fetus. It has the effect of increasing the uterine contractions that are very harmful and could lead to miscarriage. Especially women with a history of early miscarriage should stay away from using cinnamon. If a pregnant women consumed excessive amounts of ginger during the first months, then it may lead to bleeding and early abortion. Despite the many benefits of cress, you do not have to eat it during pregnancy because it causes uterine contractions and therefore lead to spontaneous abortion. But you can take advantage of it before this period, it enhances fertility and helps to get pregnant. Pregnant women should not use nigella during pregnancy because the oil attached inside the seed may cause the fetus harm. It also shouldn't be used for babies or taken while using other chemical drugs or remedies. Nigella is bad as a treatment for people who use aspirin on an ongoing basis as well as warfarine and with chemotherapy for cancer, nor with cortisone. Consuming too much in the first three months may cause neurological defects and harm the fetusus's brain that can lead to his/her death. It has the same harm effect as saffron; it weakens the nerves of the fetus and hinders the growth of the nervous system, therefore causing death. This herb can harm pregnant women in the first three months of pregnancy. This booster herb is a telltale of the uterus so it should be avoided during pregnancy because it can cause excessive projection at any time. This herb is harmful during pregnancy because it is a stimulant to the womb and can cause excessive projection at any time. Eating fish during pregnancy may protect babies from disease eczema (skin disease). That's because fish contain a fatty acid found in fish (omega-3) It was found that those babies whose mothers were fed on fish in pregnancy period are less susceptible by 50 percent. Scientists confirmed that acid (omega-3), which passes through the placenta affects the immune system, which protects the fetus from having eczema. Doctors usually recommend pregnant women not to eat more than four pieces of fish in a week because high quantities of some types of fish may cause the occurrence of mercury poisoning. This kind of bacteria exists in soft cheeses, milk, non-pasteurized and dairy products, meat, chicken or ready to eat seafood or uncooked food or old leftovers. May cause symptoms of common cold that could be transported to the unborn child. As the fetus may lead to miscarriage or premature birth, blood or congenital malformations of the embryo / fetus abnormalities in the formation due to poisoning. It is a parasite carried by cats, and may also contaminate the food. Toxoplasmosis usually caused by eating undercooked meat or vegetables or unwashed fruit. They usually do not cause any symptoms but it is certainly harmful. It is worth mentioning that some women do have the immunity from toxoplasmosis and it is wise to ask the doctor. raw meat or uncooked foods such as sushi, seafood, turkey and other products. raw eggs or foods that contain it such as mayonnaise, sauce, homemade ice cream or custard, because raw eggs may carry salmonella bacteria. Soft cheeses like feta, Camembert and American soft cheese. Fish is very useful, but avoid fish containing high amounts of mercury stored in the fatty tissues such as shark, monkfish (Mackarel), swordfish, Tile fish, and because the high amounts of mercury consumption for pregnant will lead to an imbalance in the composition of the fetal brain and may lead to delays in child development (delays in learning to walk or talk). Use safe cooking of meat and chicken. Stockpile the raw meat away from cooked food to avoid the transfer of bacteria. Wash fruits and vegetables well and use special cutting tools for fruits and vegetables (separated from the meat cutting tools). Wash and sterilize the cooking utensils as well as the kitchen. If you suspect that the food presented has the above bacteria,it is best to discard it. Stick to homemade food and avoid international foods at restaurants, because you simply can't tell how the food is cooked or whether any harmful components are added to it. Feel free to share your thoughts and tell us if the above article has been somewhat helpful to you?